Avocados are an Australian breakfast staple. Try an Italian twist on your avocado smash. This is my take on the classic Australian breakfast dish, avocado smash. 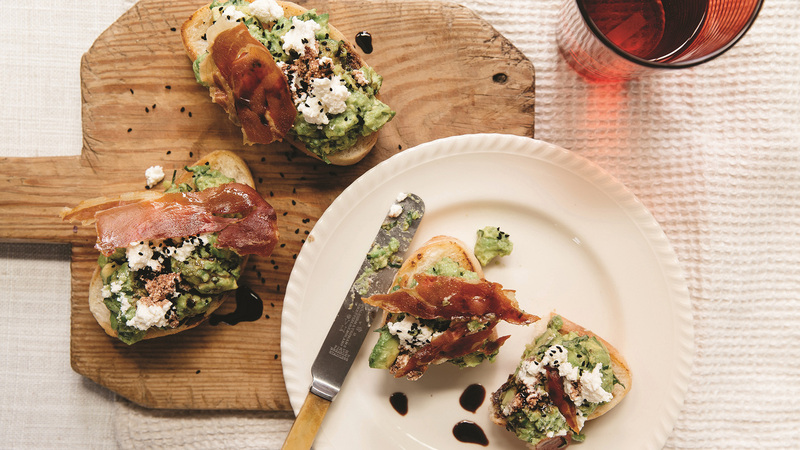 Drizzling balsamic syrup on avocado may seem strange, but the salty flavours of the prosciutto and the sweetness of the balsamic syrup really enhance it. This café style breakfast can feed as many as you like, just adjust the quantities accordingly. All the elements can be prepared, then assembled all at once and served on a big platter. Top each one with a poached egg if you like. You can buy balsamic syrup, but it’s easy to make yourself and last ages in the fridge. I have included the recipe here. 1. Drizzle the ciabatta with a little olive oil and grill or toast until golden. 2. Preheat oven to 180°C (350°F). Lay the prosciutto onto a baking paper lined oven tray and cook for 10 minutes, or until crisp. Set aside. 3. Peel and de-seed the avocados and place in a bowl with the lemon juice, minced garlic and basil. Roughly smash with the back of a fork. Don’t mash it too smooth, you want texture. Season with salt and black pepper. 4. Spoon a quarter of the avocado mix onto each piece of toasted bread. Crumble a little ricotta over each and sprinkle with seeds. Drizzle with a little balsamic syrup and top with a slice of crispy prosciutto. 1. Combine the vinegar and sugar in a small saucepan. Bring to the boil, stirring, then reduce heat and simmer, stirring every now and then, until mixture is thickened and syrupy. Recipe from Food for Sharing Italian Style by Liliana Battle, available now from New Holland Publishers. Subscribe to Live Better and receive our 'Healthy Living' recipe book FREE! As well as delicious recipes, food inspiration, offers and promotions straight to your inbox each week.